Printed on recycled card stock, these folding "Vineyard Motif" place cards are perfect for your vineyard-themed wedding. 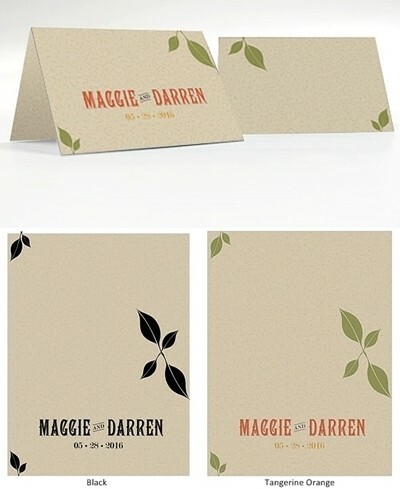 You may choose from black or tangerine orange to print your names and wedding date on the Kraft-colored background. PLEASE NOTE: Sold as a set of six (6) and prices quoted below are per set. Due to personalization, the minimum order quantity is four (4) sets of six (6). Left Name: Enter up to 8 characters. Right Name: Enter up to 8 characters.